Imagine ancient white hamlets perched on high cliffs, overlooking the deep blue Tyrrhenian sea. Add cytrus fields, steep light grey mountains, medieval churches, hidden fjords and beaches. Complete with amazing sea food and a “dolce vita” feeling stronger than anywhere else in Italy. That, and much more, is the Amalfi coast, Italy: you can’t really say you know Italy without visiting this delightful destination. While you can have a glimpse of it in a day trip from Naples or from Sorrento, the Amalfi coast deserves at least two or three days, if not an entire week. So here is my personal Italy Amalfi coast Italy itinerary. It will let you explore all the area, including off the beaten path jewels such as the mills valley and the astonishing “path of the gods” trail . My recommendation is to complete this tour by one or two days in Capri, which could be easily reached by hydrofoil from Positano. In my view, Sorrento can be skipped, but I leave this to you. A last tip: like most central Italy destinations, best time to visit the Amalfi coast Italy is from May to early July, and, even better, from mid September to October’s end. Weather is perfect and the area is not too crowded (better to avoid week ends if possible). Absolutely avoid July and August, when the heat and the crowds would spoil most of the enchantment. My Amalfi coast Italy itinerary starts in Salerno, very conveniently located for those arriving from Rome on a high speed train. Salerno itself deserves a visit, but if you are short of time, just jump on a cab to the harbour and get the hydrofoil to Amalfi (here is the Ferry company web site). You may also take a bus, but a journey by boat will give you a fantastic initial glimpse of the coast. Amalfi used to be one of Italy’s four powerful maritime republics (with Venice, Pisa, and Genoa). Today, Amalfi is one of southern Italy top touristic destinations. 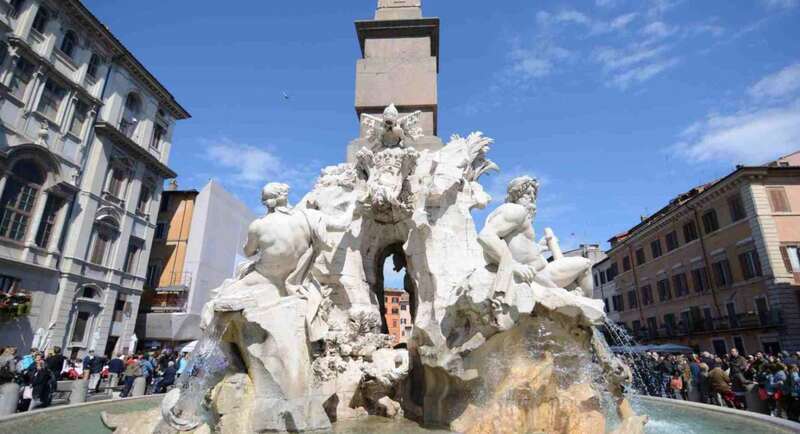 You will enjoy its scenic seafront setting, its tiny, centuries old alleys, crowded of interesting workshops and delightful restaurants, and, of, course, its amazing cathedral, the Duomo. Amalfi’s cathedral, the “Duomo di Sant’Andrea”, is a beautiful middle age church, perched on top of a monumental stairway and fronted by an intricately patterned façade. Next to the church lies the XII century Chiostro del Paradiso, or Cloister of Paradise, whose somber Romanesque tone is enlivened by Arab elements. You can decide to sleep in Amalfi or to spend the night in romantic Ravello. Your second Amalfi coast Italy day starts in ravello, which is considered one of the most romantic and beautiful small towns in Italy. Perched on steep, terraced slopes it is a place blessed with lush gardens, quiet lanes, sleepy, sun-drenched corners. Perched high above sea level, Ravello will offer you unbelievable views over the azure coast below. Highlights of your visit are the 11th-century cathedral and its two major villas, Villa Rufolo and villa Cimbrone, who have hosted many VIP travellers of the past such as Richard Wagner (both can be visited). Villa Cimbrone is now a hotel, where you can enjoy spending a night (if your wallet is big enough!). When you are done with Ravello, you can visit the Valle dei Mulini, a steep-sided ravine dotted with ruined watermills (“mulini”). Locals once used the mills to make paper, an industry for which Amalfi was, and still is, famous. It’s a fresh and relaxing walk, far from amalfi’s crowds. Your third Amalfi coast Italy day will lead you to Positano, not before discovering some really amazing jewells along the road. Leaving Amalfi towards Positano, you will find many places worth a visit. Grotta dello smeraldo is one of the unmissable ones. Conca dei Marini is one of the several delightful hamlets that dot the Amalfi coast. However, what makes it unique is the astonishing Grotta dello Smeraldo (the emerald cave). This cave is a cove in the coast which contains all the most spectacular colours of the nature. The visit by small rowing boats will be one of the highlights of our trip. Your next stop after conca dei Marini is the lovely Furore fjord, another often overlooked sight. It’s a great place for a stop, especially on midday, when the sun manages to break through the narrow gorge and shines on the short beach. An old lime kiln has been converted into a bar and gift shop, perfect place for a glass of white whine. Continuing west from Amalfi, the increasingly spectacular corniche will get you to Praiano. Praiano has two characteristics: the stairways and the little votive altars. Stairways are everywhere but the continuous up and down is worth the effort because the panorama is breathtaking. The little votive altars were built by the families on their properties to claim their possession to the place. Take some time to go visit the beautiful church of San Luca Evangelista, that is the fulcrum of the city, and the Torre a mare (Tower in the sea). Back on the road, after a few miles you will get to breathtaking Positano. Plan to arrive in the afternoon, so you can enjoy the sunset and leave more time to day four. Positano is the most impressive town on the Amalfi Coast, and arguably the most photographed of the region. Its the highlight of your Amalfi coast Italy trip. Seen from the sea, Positano shows a dramatic vertical panorama of colors. The green of the Monti Lattari, the white, pink and yellow of the Mediterranean houses, the silvery grey of its pebble beaches and the blue of the sea. Just amazing! The sea colour is crystalline and its black, volcanic sand beaches such as Marina grande and Fornillo are an irresistible temptation. On top of the exceptional landscape, you will love the church of Santa Maria Teresa of the Assumption and its colored tiled dome, the Saracen towers, the little villages of Nocelle and Montepertuso which are places of an extraordinary beauty. Positano is also known for its shops, selling local pottery and leather sandals. Local craftsmen produce them in traditional small workshops you can visit. Don’t forget to taste local delicacies: on top of seafood you should have a try to local desserts such as Delizie al limone (soft pastry with a delicious lemon flavoured cream) and torta positanese (cake with almonds). If you are looking for god, traditional food, and an amazing view, opt for the restaurant La Tagliata. It’s up in the mountain (they can organize transports) and the experience is absolutely breathtaking. If you have a car, you may enjoy one of the most exciting driving experiences in Europe by driving from Positano to the end of the Amalfi gulf. The roads along the Amalfi Coast are famously winding, narrow, and challenging to drive. Add in drop-dead views and daring Italian drivers, and you have all you need for a high adrenaline experience! However, better to plan a drive of the Amalfi Coast during the shoulder tourist seasons. In mid-September to October and May, the road is less crowded and lumbering tour buses are fewer. Another great activity you could plan when in positano is a hike on the God’s Path (Sentiero degli Dei). The Sentiero degli Dei links the tiny hilltop town of Agerola with Nocelle, a fraction of Positano nestled on the slopes of Monte Peruso.The name of the footpath clearly suggests how amazing the views could be! The hike can be hard, especially during hot summer days, so plan it with care. Local guides are available to assist you. On your last Amalfi coast Italy day, you can either proceed to Naples (and,, why not, have a stop in Pompei) or take an hydrofoil to Capri for a glorious conclusion of your Amalfi coast Italy trip. Then from Capri you can easily get to Naples (many hydrofoils, one hour trip) and then to Naples train station. To know more about why you just can’t miss Capri, have a look at my post: Capri: breathtaking Faraglioni and Natural Arch walking tour. steep walks. I am a walker but mostly on flat surfaces. So, could you tell me if you think that the people who go to the Amalfi coast have to be very fit ? Thank you for all the information that we find on your blog. I am particularly interested in photography. The Amalfi coast seems to be an amazing place for that ! So don’t need to go to the Gym to enjoy this lovely corner of Italy! Thank you for the quick response to my e-mail and all the info. I like to read that it may be possible to go to the Amalfi coast. I have been reading about Ravello and the villa Rufolo and its gardens. That’s high on my list of places to go for photography. Also the villa San Michele in Capri. Sorrento is another city where I would like spend some time. I will look for info about transportation, especially by the end of May. Is February a good month to travel to Italy? What is the weather like? Hi Ronda, February is a rather cold month in Italy, with really short days (sunset around 5-6 PM). In general, it’s not a rainy period. . It’s the perfect time to go skiing, maybe less recommended for destinations such as Amalfi coast. Best period to visit italy is May-Beginning of December and September – October. That said, February would be low season, so no tourist crowds and much better prices in hotels. It’s usually a good period to visit the Amalfi coast, nice weather, not too hot, not too crowded. I used to swim there until late ocober. Hello, I am planning a family trip to this region. We are wanting to spend 5 nights and prefer to stay in the same location. What town do you suggest that is central for getting around via boat, train, bus during the day and has enough to offer in the evening. Mainly delicious restaurants. Being on the beach is a must. Last visit we did Cinque Terre and stayed in Monterosso, so something like that is what I am picturing. Hi Sally, the obvious choice would be Amalfi, which, unsurprisingly, is the Amalfi coast hub. Positano could be a good choice as well, I like it more than Amalfi, but it’s getting rather expensive. Transports vary depending on the season, this is an aspect you may want to consider as well. Luckily there are no trains in the Amalfi coast, the closest train stop is Salerno. However, if you also wish to visit Naples, Pompei, Capri, etc, then you should choose Sorrento as a hub. Drop me a note if you would like me to assist you on your trip planning. Great post, we’re doing a two week trip to Italy. Flying into Rome, Amalfi Coast, Venice, Florence then back to Rome, since we’d like to spend more time on the Amalfi Coast. We want to rent a car from Amalfi (we want to take the ferry from Salerno). Any recommendations of who to use? Hi Larissa, thanks for liking Delightfullyitaly! I personally use rentalcars.com, it’s an easy way to find the best offers on the market. Enjoy your stay and do contact me if you would like support in trip planning, hotel reservations etc!